In the office, we’re often passing around links to great content we find online, whether it be pet videos that make us swoon or new recipes that make us drool. We figured that if we think they’re good enough to share in the office, they’re good enough to share with everyone! 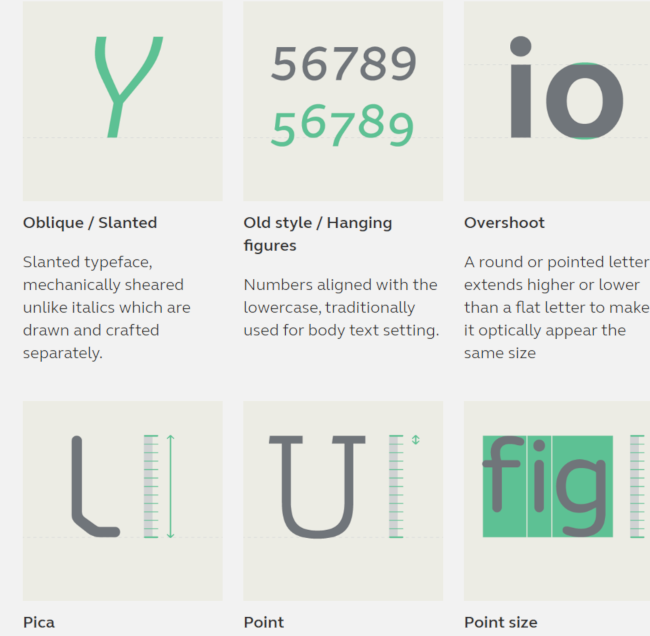 So here’s a few of the best typography-related infographics we’ve discovered in our search. 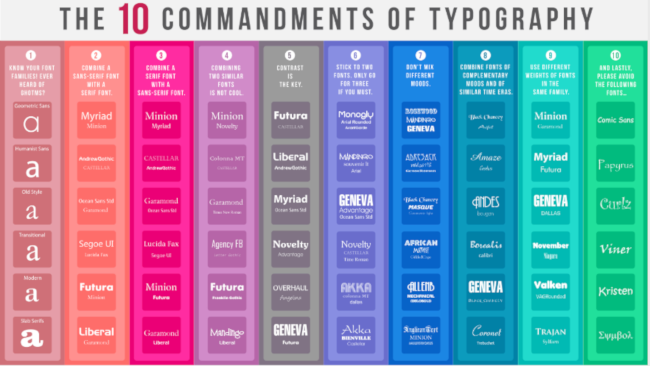 If you only look at one infographic on typography, this one should be it. 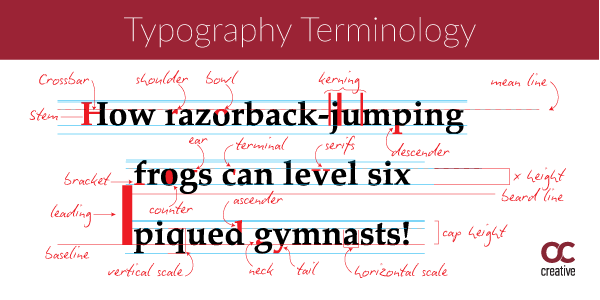 From serif fonts to sans serifs to display fonts, this list breaks down anything you might want to know about the look and terminology of typography. Easy-to-follow examples and exhaustive definitions make this the first place on the internet you should check out if you’re curious about the ins and outs (or the ascenders and descenders) of modern typography. Trying to decide on a typeface? Follow these rules to avoid making a visual faux pas. 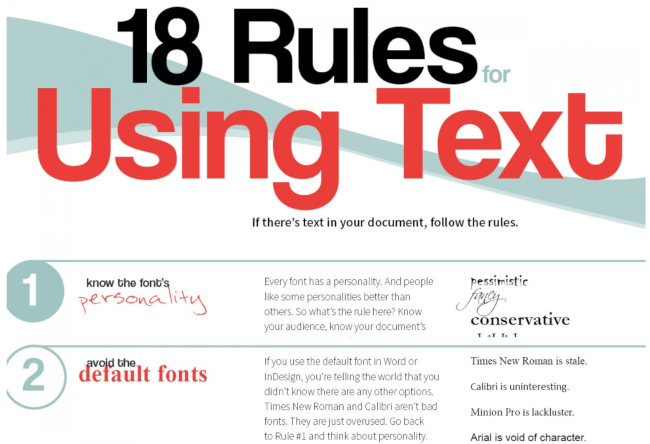 Whether you’re looking for rules on what fonts to choose or how to effectively emphasize with text, this infographic has it all. It features visual examples so you never have to guess how something will look before you try it. We have used this when teaching clients and interns design in the past and will keep it in our holster for whenever we need it. See all 18 rules here. This infographic contains more font terminology than anyone could ever need to know (for exactly when they need to know it). This one doesn’t stop at descenders and hooks, but delivers such gems as “gadzook” and “ink trap.” Fontsmith in general is full of great resources for font nerds and their ilk, and this is no exception. Even if you never use half of this information, it’s pretty entertaining. Click here to reveal the whole alphabet of terms. While it wasn’t handed down on stone tablets from a middle eastern mountain, that doesn’t mean this infographic doesn’t pack a punch. It’s got some great rules for how and why you should or should not combine fonts. And it never hurts to remind people to stop using Comic Sans and Papyrus. Come for the array of colors and well-designed graphic; stay for the helpful rules and ample examples. See what the typography gods have for you here. What About Those Pet Videos? To meet more office dogs (and one cat), see our About page. If you have more questions about typography or font design, navigate on over to our Contact page and send us a note!